Outfitted with rapid-response MSA XCell sensors, the ALTAIR 4XR Gas Detector is the toughest 4-gas monitor on the market and is backed by a 4-year warranty. The ALTAIR 4XR can also provide real-time incident awareness to team members, supervisors, safety managers and others when paired with the MSA ALTAIR Connect app via a Bluetooth wireless connection. NOTE: THIS PRODUCT CAN BE CONFIGURED - Configuration allows you to tailor the product to meet your specific needs. 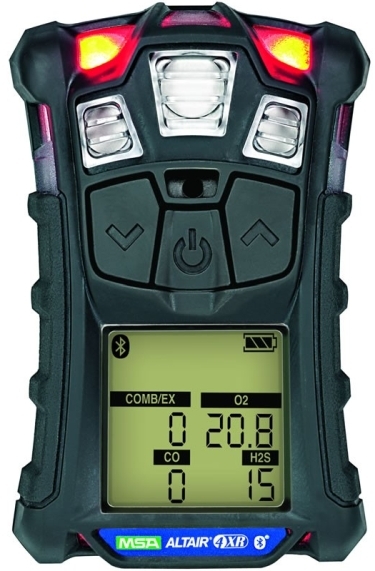 10178569 ALTAIR 4XR Multigas Detector: LEL, O2, H2S & CO. Glow-in-the-dark case. European charger. 10178570 ALTAIR 4XR Multigas Detector: Methane 0-100% LEL, O2, H2S & CO. Charcoal case. European charger. 10178573 ALTAIR 4XR Multigas Detector: LEL, O2, H2S & CO. Charcoal case. European charger. 10178581 ALTAIR 4XR Multigas Detector: Methane 0-100% LEL, O2, & H2S-LC. Charcoal case. European charger. 10178582 ALTAIR 4XR Multigas Detector: Methane 0-100% LEL, O2, H2S-LC & CO. Charcoal case. No charger.